Please refer to the registration page to apply for the accompanying person's tour. Sankeien is a stroll-around-type garden full of masterpieces of architecture. Hara Tomitaro, a silk merchant, created the garden in the image of the Nara countryside. He opened the garden to the public in 1906. Sankeien evolved as Hara scoured ancient capitals for buildings. The sanctum of Kamakura's Tokei-ji (16th c.) was moved to the garden in 1907. In 1914 the three-storied pagoda of Kyoto's Tomyo-ji rose at the tip of the garden's high ground. 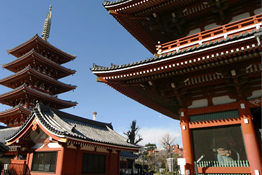 Built in the mid-15 th century, it is the oldest pagoda in Kanto. As the visitor traces the curve of the path it comes into view beyond the pond. Also part of Sankeien is Hara's private garden, which he created under the influence of the eminent priest Muso Kokushi (1275-1351) The private, or inner garden, was opened to the public in 1958. Please refer to the accommodation page to apply for the following tours. OP-1: Tsurumi flour mill, Nisshin Flour Milling Co., Inc.
*The capacity of this tour will be 40 persons. * This tour may be canceled when the number of participants fails to reach 15 persons. * KIRIN Yokohama Beer Village may be changed to visit to NYK Hikawamaru. Tsurumi flour mill, Nisshin Flour Milling Co., Inc.
Tsurumi flour mill of Nisshin Flour Milling Co., Inc. is located in Kawasaki City near Yokohama. 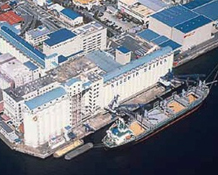 Nisshin Flour Milling Co., Inc. is the largest wheat flour milling company in Japan. Tsurumi mill has seven milling units with 2,150 metric tones of daily wheat milling capacity supplying about 10% of wheat flour consumed in Japan. The latest mill stream unit in Tsurumi was built in 2002 with the capacity of 500 metric tones per day to aim for assuring the high level of flour quality and food hygiene. You can enjoy the manufacturing process (materials, brewing, fermentation and storage, filtration, packaging) of beer with an image and a showpiece. The tasting of beer is also possible. * This tour may be canceled when the number of participants fails to reach 25 persons. 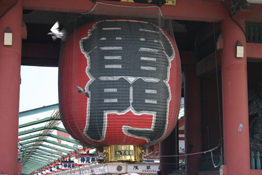 Nakamise, a 250-meter approach to Sensoji Temple, is one of the oldest shopping streets in Japan. The arcade dates from the late 17th century, when local people were granted the special right to open shops along the approach to the temple. Their shops sold toys, sweets, snacks, and souvenirs. The shopping street was destroyed in the Great Kanto Earthquake of 1923 and also in the air raids of 1945. Today's shops sell traditional knick-knacks, rice crackers, and festival foods. The street bustles and in color and motion suggests Old Edo. The Edo-Tokyo Museum shows how the 15th-century village of Edo grew to be Tokyo, one of the largest cities in the world. The museum, established in 1993, recounts this story of remarkable growth through life-size replicas and detailed scale models. 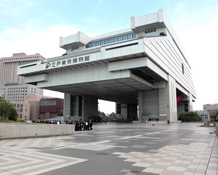 There is a life-size reconstruction of the Kabuki Theater, and reconstructions of Edo Castle and Nihonbashi Bridge. The museum accommodates international visitors with English explanations of exhibits, headphone sets, and volunteer English-speaking guides. The museum's futuristic building was designed after an elevated-floor type warehouse. 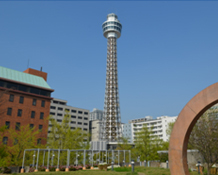 It rises 62.2 meters, which was the height of the tallest tower of Edo Castle. With a total area of about 30,000 square meters, it is 2.4 times larger than the playing field of Tokyo Dome. 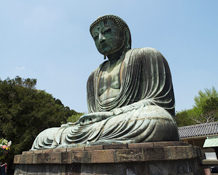 The Great Buddha, designated a National Treasure, is Japan's largest Buddhist image after Todai-ji's in Nara. The present Great Buddha is the second at the site. The original image, carved from wood in 1243, was destroyed by a storm five years later. The present sculpture was cast in bronze around 1252. This was a remarkable feat, for the image is of colossal dimensions, with a weight of 125 metric tons and a height of 11.47 meters. The Great Buddha was once housed, but a tidal wave swept away the temple in 1498. Ever since the image has been exposed to the elements. The Great Buddha is Kamakura’s greatest attraction. Many consider it more beautiful than the image in Todai-ji. 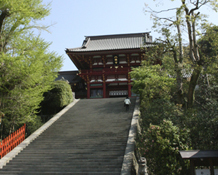 Founded at its present location by Yoritomo Minamoto in 1180, Tsurugaoka Hachimangu remains one of the most popular shrines in the Kanto region. Yoritomo had relocated the shrine from Tsurugaoka near the Yuigahama coast to make it the core of Kamakura. He ordered built the Wakamiya Oji approach from the shore to the shrine as a prayer for an easy delivery by his wife. The shrine burned down in 1191. 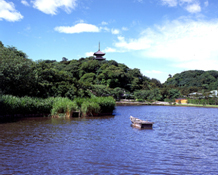 Yoritomo rebuilt it on a graded hillside and dedicated it to the Minamoto tutelary deity. It was then that the shrine acquired its present arrangement of upper buildings and lower buildings. The present buildings date from 1828. 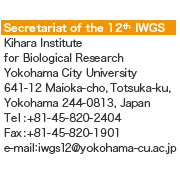 Please refer to the details on the following URL. Participants wishing to reserve tours should apply online no later than August 15, 2013. Application should be accompanied by a remittance covering total tour fare due JTB GMT. No reservation will be confirmed in the absence of this payment. Personal checks are not accepted. All payment must be in Japanese yen. If the remittance covers more than one person, please inform us the name of each participant. * After making a remittance, please send us a copy of the bank receipt to avoid possible confusion. Your reservation would be completed upon receipt of your online tour reservation information and verifying your payment. The Confirmation button will be displayed when you complete your reservation. Please print your confirmation slip by clicking the Confirmation button and bring it with you on the departure date.